June 5 is National Donut Day! 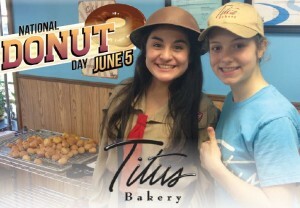 The Salvation Donut Girl will be here to give away donut holes on Friday, June 5. People can decorate donut holes, try a free sample of our Pershing Blend coffee, or purchase Boar’s Head hot dogs which will be served for $1. Between 12-2pm there will be a scavenger hunt for kids around town. Stop by the bakery starting at 6am to get a card with the names of participating businesses. Kids will need to visit each location, play a game and get the card stamped. Bring the completed card back to the bakery and receive a special treat. Also, while at each location, each participant will receive a special clue. The clues will lead the participant to a special location in town and the one to arrive first will receive a dozen Pershings. Each participant will receive a card for a yeast donut regardless. Throughout the day, Radio Mom will be giving away a dozen donuts every hour along with additional clues from noon to 2. The Salvation Army will be present with their kettle taking donations. The idea for Donut Day began on the battlefields of France during World War I when Salvation Army workers served coffee and donuts to soldiers in the trenches. Rations were poor so the donut idea was conceived as a means of bringing the soldiers cheer. Donuts were not the reason Salvation Army workers were in the fighting zones of France. Those men and women were there primarily to give spiritual aid and comfort to the American soldier and his allies. They were there to be a link with home and family. Today, Salvation Army workers continue to care for and comfort thousands of people each day who battle hunger around the world and here in the Chicagoland area. By supporting Donut Day, with a donation or through volunteering, you help The Salvation Army keep its food pantries, meals on wheels, senior citizen feeding programs and childcare nutrition programs alive and well. If you can give a few dollars or a few hours of your time, you will help provide 1.5 million meals to the hungry in Chicagoland. Posted in Local Community, Titus Events. We won Best Specialty Donut on National Donut Day.